With Indonesia enormous captive market and natural resources, Elvyn who was joining IPC in 2016 has an ambition to revolutionize IPC into a port operator that could provide a sustainable and optimum added value for all stakeholders in order to improve national and regional economy through significant changes in its strategic approach and policy. To meet IPC’s vision, he conducts some transformation efforts in the company to enableIPC to be a world class port operator. Elvyn G. Masassya was born in Medan, June 18, 1967. He finished his Master degree in Finance in ITB (Bandung Technology Institute). In addition to other academic qualification, he also holds several certifications from Indonesian Banker Institute; Investment Banking from Sydney University; and Risk Management-IRPA Hong Kong. In term of his professional career, he has more than 20 years of astonishing experience in financial services. In early years, Elvyn began his career in 1991 as Credit Analyst of Clemont Finance, Indonesia. After joining BNI - one of the leading Banks in Indonesia, his career rose significantly since then. 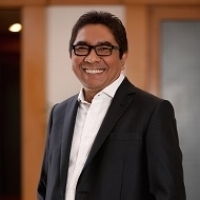 From 2001 to 2016, he has jump from a top-level position to another; Chairman of Financial Intelligence Indonesia (2001); Commissioner of Bali Bank (2002); Director of Permata Bank Indonesia (2002-2006); Corporate Secretary of BNI (2007); Managing Director of PT. Tuban Petrochemical Indonesia (2008); Investment Director of PT. Jamsostek Indonesia (2008-2012); President Director of PT. Jamsostek Indonesia (2012-2013). During his career as the President Director of Indonesia Social Security Provider for Manpower (BPJS Ketenagakerjaan) in 2014, he has shown a great leadership and produced many strategic decisions to develop the institution. It is no wonder if he became one of key person in the transformation of social security system in Indonesia. Besides his extraordinary career path, Elvyn continuously won various achievement in Indonesia, for instance the Tough CEO’s in 2012-2013, Indonesia Most Admired CEO in 2013, the Best CEO with High Responsibility in 2013, the Most Analytical Insurance CEO in 2013, Antara Achievement Award in 2013, the Most Inspirational CEO in 2014, Leadership & Learning Series Award in 2014, Best Individual Achiever CEO in 2015, iTech Magazine Award, Best CEO in 2016, TOP Leader on CSR Commitment in 2017, CEO Special Award in Productivity 2017, Best CEO of Indonesian Stated-owned Enterprises 2017, PR Indonesia Best Communicators, Category CEO 2017, and Top Leader in ICT Leadership in 2017.